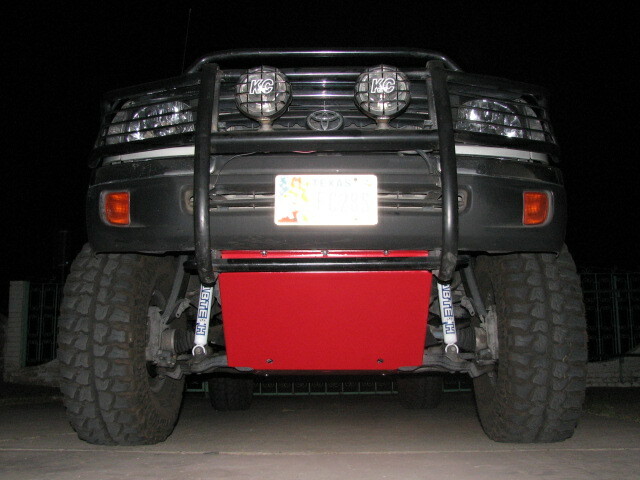 This Front Skid combines extreme protection for your underbelly, while helping you slide over obstacles with ease. 100% bolt on! BudBuilt steel is all laser cut to perfection. BudBuilt skids are shipped with professional finishing, making them easy to handle. This easily bolts up to existing holes in your frame for convenient installation with new hardware supplied with your skids. Durable and strong, steel is the workhorse of armor. Ready to take hard hits from rocks and stumps. We recommend 3/16" steel where the application sees occasional to frequent rock impacts. Steel requires powder coating or user-applied paint to prevent rust. With the same durability and strength of steel, stainless steel has the additional benefit of not requiring paint to prevent rust. Most of our stainless steel users choose this material because with regular rock impacts, even industrial powder coating can be scraped off. Stainless steel offers users the freedom to drag our armor over obstacles and not require prepping and repainting impact areas. Strength without the weight. Our 5052 laser cut aluminum alloy has the same strength levels as our 3/16" steel, but at a faction of the weight. We recommend aluminum where the application sees regular off-roading, yet limited potential for dragging on hard surfaces like rocks. While 1/4" aluminum has the strength to handle heavy rock impacts, it is much more susceptible to galling than steel, when dragged over rocks. Galling results in what looks like fine aluminum shavings by the rock that was dragged down the plate. Another way of thinking about this is by first stating that aluminum has no problem at impacting an obstacle, it's what happens after impact that matters. After impact, if your driving style is to reassess the trail and choose a better line, aluminum is the right choice. If your driving style is to continue on the same line, as in rock crawling applications, we would recommend our 3/16" steel (Rock Armor) systems. Aluminum does not require prepping and repainting impact areas to prevent rust. BudBuilt, being one of the few industry manufactures to not just design, but build in house, can easily customize any product for you. If you have an idea, call us, our passion is to help you bring your dream into reality. We will always ensure that any item that leaves our shop is fit for the BudBuilt name. A well engineered, well designed, overly strong and lasting product. We utilize a higher quality industrial powder coating process thru Powder River Technologies. The process is second to none, from the white metal blasting and iron phosphate wash, to the zinc primer and Cardinal top coating, your product will be professionally finished. We can do almost any color and texture. Visit Cardinal Paint, our powder supplier, for color charts and texture options. Please allow an additional week for powder coated items to ship, due to the attention to detail of the coating process and the transportation time between shops. All BudBuilt products are sanded and prepped prior to shipment, ready for you to paint the color of your choice. All items will usually just need a final wipe down with solvent before applying paint. Bare metal helps to keep the cost of the parts down and allows you to fully customize your rig.